Naeha Subramanian graduated with a Bachelor’s degree in Microbiology in 1999 and a Masters in Biomedical Science in 2001 from the University of Delhi. She received her Ph.D. from the National Institute of Immunology in 2006. 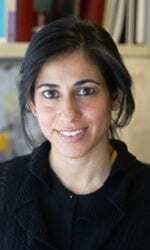 After completing postdoctoral training at the National Institutes of Health, she joined the Institute for Systems Biology as an Assistant Professor in 2014. The vertebrate immune system uses a variety of pattern recognition receptors to detect pathogens or tissue damage and mount an inflammatory response for host defense or wound healing. Nucleotide-binding domain leucine-rich repeat containing receptors (NOD-like receptors or NLRs) form the largest known family of cytosolic sensor proteins that detect ligands of microbial or endogenous origin and stimulate innate immune activities. Upon activation, some members of the NLR family such as NLRP3, NLRP1, and NLRC4 form a macromolecular signaling complex called the inflammasome that acts as a scaffold for activation of caspase-1 leading to processing and secretion of the potent inflammatory cytokine IL-1. Others such as NOD1 and NOD2 form signaling platforms that activate NF-B. Several newly emerging aspects of NLR biology also point to functions that extend beyond inflammation to include tissue homoeostasis, autophagy, embryonic development and nuclear functions as transcription factors. In humans, twenty-two NLRs have been identified which are hypothesized to have distinct biological functions. Gain-of-function mutations in NLRs are associated with a host of severe human cancers, autoinflammatory and autoimmune diseases, yet to date the signaling cascades and immunological roles most NLRs remain unknown. 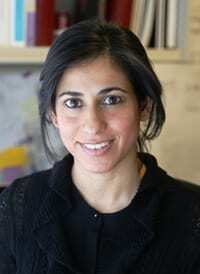 Research in the Subramanian lab focuses on understanding the function and regulation of NLRs in innate immunity. We apply unbiased systems biology approaches using a combination of transcriptional profiling, proteomics, computational analyses and functional assays to define NLR response phenotypes and associated signaling pathways. We also use sub-cellular imaging to study the role of intracellular positioning to organelles in the regulation of innate signaling pathways, with an emphasis on mitochondrial regulation of the inflammasome. Our goal is to discern novel cellular functions and regulatory mechanisms of NLRs, ultimately uncovering new targets for therapeutic modulation of NLR function in autoimmunity, autoinflammation and cancer. Hutcheon C, Paulvannan P, Subramanian N*. Cytoplasmic sensing in innate immunity. Encyclopedia of Cell Biology, edited by Ralph A. Bradshaw and Philip Stahl. Vol.3, Pages 710-726, 2016. ISBN: 978-0-12-394796-3. Rommereim L.M., Subramanian, N*. AIMing 2 Curtail Cancer. Cell. 162: 18-20, 2015. Subramanian, N*., Natarajan, K., Clatworthy, M., Wang, Z., Germain, R.N*. The adapter MAVS promotes NLRP3 mitochondrial localization and inflammasome activation. Cell. 153: 348–361, 2013. *Corresponding authors. Lee, G.S., Subramanian, N., Kim, A., Aksentijevich, I., Goldbach-Mansky, R., Sacks, D.B., Germain, R.N., Kastner, D.L., Chae, J.J. The calcium sensing receptor controls NLRP3 inflammasome activation through intracellular Ca2+ and cAMP. Nature 492: 123-127, 2012. Kastenmuller, K., Torabi-Parizi, P., Subramanian, N., Laemmerman. T., Germain, R.N. A spatially organized multicellular innate immune response in lymph nodes limits systemic pathogen spread. Cell 150(6): 1235-1248, 2012. Ombrello MJ, Remmers EF, Sun G, Freeman AF, Datta S, Torabi-Parizi P, Subramanian N., Bunney TD, Baxendale RW, Martins MS, Romberg N, Komarow H, Aksentijevich I, Kim HS, Ho J, Cruse G, Jung MY, Gilfillan AM, Metcalfe DD, Nelson C, O’Brien M, Wisch L, Stone K, Douek DC, Gandhi C, Wanderer AA, Lee H, Nelson SF, Shianna KV, Cirulli ET, Goldstein DB, Long EO, Moir S, Meffre E, Holland SM, Kastner DL, Katan M, Hoffman HM, Milner JD. Cold urticaria, immunodeficiency, and autoimmunity related to PLCG2 deletions. N Engl J Med. 366(4): 330-338, 2012. Kastenmuller, W., Gasteiger, G., Subramanian, N., Sparwasser, T., Busch, D.H., Belkaid, Y., Drexler, I., Germain. R.N. Regulatory T cells selectively control CD8+ T cell effector pool size via IL-2 restriction. J. Immunol. 187(6): 3186-3197, 2011. Subramanian, N., Qadri, A. Lysophospholipid sensing triggers secretion of flagellin from pathogenic Salmonella. Nature Immunol. 7: 583-589, 2006.